[vc_row][vc_column][vc_column_text]Bangkok is a sleepless night city. There are lots of things to do, see and shopping place to visit. The night market is a famous visiting place. Don’t know where to go, Or do not know things to do in Bangkok at night. You can not miss to read this article. We just update this ARTICLE IN AUG 2017 , so it is fresh and very recent update information of night market in Bangkok. There are several night markets, which wait for you to explore. The visitor can find cloth, souvenir, hand-made & vintage stuff and much more. Asiatique the riverfront is one of the largest night market in Bangkok. 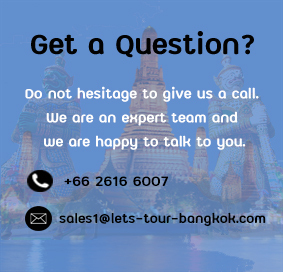 Beside a beautiful Chaophraya river walk, there is a huge shopping area, where many inexpensive souvenir shops, good air conditioned restaurants, food courts and beer gardens with live music are located. Also, it is a famous market where many activities can be found, such as Ferris wheel. Due to the large area, the market is divided into many sections, and the products sold are of mixed variety, such as hand-made souvenirs, carved woods, home decorations, clothes, painting, jewelry, etc. Bargaining should be done. This is another place where night life in Bangkok can be seen. Some people go window shopping to kill time while waiting for the Calypso show to start. There are also puppet show and Muay Thai live show here which is the most glamorous puppet show in the country. In the evening of each Tuesday (5.00-10.00 pm), anyone who loves flowers, tree and garden decoration items, should not miss this place. You will enjoy walking around see nice flower, orchid and plants. It is a place for those who is garden mania. The Train Market Ratchada is located in the heart of the city. it’s close to Cultural Centre MRT Underground Station. Open every day of the week at 5.00-12.00 pm This market is full with vintage stuffs. It is a great place for those who love ancient, classic thing and second hand products. Old watch, lamp, motorcycle spare part is also selling here. This area is open air, which you can walk around taste some drink, street food, snack or dessert while shopping a very unique product. Khao San Road is another popular place to visit. It is the center of the tourists and you can shop in a very good price here. As the streets are filled with clothes, street food, night clubs, restaurants, Thai massage and much more. It opens every day, but will be more lively at night time. If you ‘re looking for a place to hang out Khao San road is definitely a must!. The ArtBox night market has received the attention from tourists because it’s different from the other night market. The stalls are located in shipping containers which makes it look cool. Things that you can find here are mostly food and each of them are unique. it’s open Thurs- Sun 4.00-11.00 pm. To keep in touch where Art Box Bangkok is heading to next, check their Facebook page. ChangChui is an inventive night market. The concept is to make this as new destination for new generation or you can say that this is the center for creative people. It has Art Gallery, Theatre, Cafe& Restaurant , Private Museum, Creative Shop, Street food and much more. It’s open Tues – Sun 4.00-11.00 pm. So , you know what is COOL in Bangkok. One night in Bangkok is not enough, isn’t it? Hope you find what fit you and enjoy YOUNG NIGHT IN BANGKOK. But HEY ,,, this is a very secret information , can you just keep it secret !